This luxury 4 bedroomed villa with VERY large heated pool and air conditioning is fully equipped, with everything included to ensure you have a perfect 2014 holiday. Situated in a peaceful residential area only a stones throw from Vale do Milho Golf Club, the nearest restaurant with fabulous garden and children's play area is just a 500m stroll away, and the centre of Carvoeiro with an array of restaurants, shops and bars a short drive. The ideal place for a wonderful family holiday. 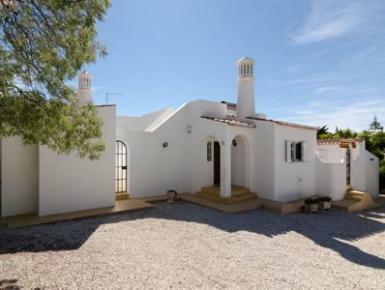 The 4 bedroom ground floor villa is situated in the residential area of Vale do Milho, only a stones throw from Vale do Milho Golf Club. It is a piece of home from home, surrounded by its own large gardens, and benefits from a terrace with ample sun loungers, brick built BBQ, and large al-fresco dining table & chairs overlooking the gardens, large retractable sun awning on pool terrace, and VERY LARGE POOL heated pool, measuring 16m x 8m.